Innovation Radar aims to identify high-potential innovations and innovators. It is an important source of actionable intelligence on innovations emerging from research and innovation projects funded through European Union programmes. Data underpinning the Innovation Radar stem from a survey developed by the Directorate General for Communications Networks, Content and Technology (CONNECT) and the Joint Research Centre (JRC) of the European Commission.This survey is conducted during periodic reviews of collaborative projects funded through European Union (framework) programmes like Horizon 2020. Survey results are used to calculate two core indicators which are the basis for classification in 4 different maturity levels. The first indicator is the Innovation Potential Indicator which aims to measure development towards commercialisation. The second is the Innovator Capacity Indicator which aims to capture the innovative capacity of the innovators behind these innovations . As these indicators are used for information purposes and classification only, individual indicator data are not disclosed publicly. They do not indicate the overall performance of a project or consortium, and are not used to assess the use of resources in an EU-funded project. Innovations listed on this website are not ranked according to indicator scores. Innovation Readiness: This indicator relates to the technical maturity of evolving innovations. It aims to define the development phase of innovations. It accounts for the steps undertaken to prepare them for commercialisation (e.g. prototyping, demonstration or testing activities or a feasibility study) and to secure their technological resources. Furthermore, this indicator takes into account the time to the potential commercialisation. Innovation management: This indicator addresses the project consortium and its commitment to bring innovations to the market. It aims to measure the capability of management teams to transform novel technologies or research results into marketable products or services. To this purpose, this indicator includes, among others, clarifying the related ownership and IPR issues, preparing a business plan or market study, securing capital investment from public and private sources, or engaging potential end-users in the project. Market potential: This indicator relates to the demand and supply side of innovations. Regarding the demand side, it concerns the prospective market conditions and the chances of successful commercialisation. It aims to assess how products or services satisfy a market sector and serve a potential customer base. With respect to the supply side, it aims to assess whether there are potential barriers (e.g. regulatory frameworks or existing IPR issues) which could weaken the commercial exploitation of innovations. 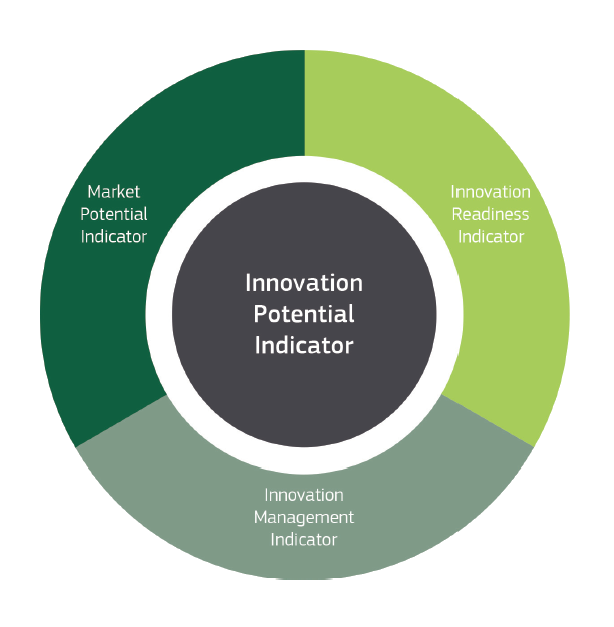 The Innovation Potential Indicator is created as an arithmetic aggregate of these three indicators. Innovator’s ability: This indicator relates to the ability of organisations in developing innovations within the EC-funded activities. It accounts for the number of times organisations have been identified by the Innovation Radar as key innovators. It includes other factors such as reviewers’ opinions about innovators’ potential and independence in fulfilling the market potential of innovations. Innovator’s environment:: This indicator aims to capture the overall conditions in the project consortium which an innovator faces. It relates to the composition and activity of partner organisations, the performance of the project in terms of innovations, and the commitment of relevant partners to exploiting innovations. Moreover, it also takes into account the presence of organisations that are directly interested in exploiting the innovations. It is assumed that a positive environment will have positive knowledge spill-overs between innovators and their environments. 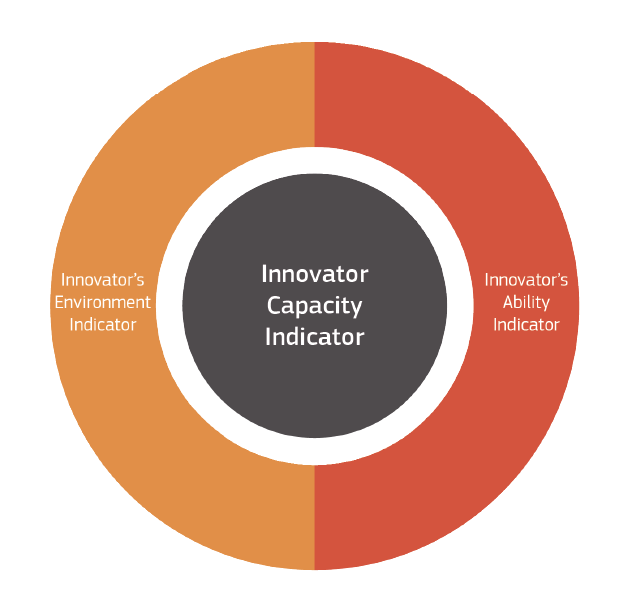 The Innovator Capacity Indicator is created as an arithmetic aggregate of these two indicators. Optimisation: This category includes innovations outperforming in innovation management and innovation readiness. These innovations are technologically mature and show high commitment of the project consortium to bring them to the market. They are considered ‘Ready for the market’. Creation: This category includes innovations progressing on technology development process (e.g. pilots, prototypes, demonstration). They are considered ‘Advanced on technology preparation’. In order to capitalise on the potential of these innovations, the management team needs to focus on transforming a novel technology or research results into a marketable product or service and to prepare its commercialisation. Commitment: This category includes innovations for which concrete market-oriented ideas have been put together (e.g. market studies, business plans, end-user engagement). They are considered ‘Advanced on market preparation’. Their commercialisation depends on progressing on technology development. Exploration: This category includes innovations, which actively explore value creation opportunities. They are considered ‘Getting things started’. These innovations are in the early phases of technological readiness, but already show high commitment levels from the organisations developing them. Their commercialisation requires efforts in transforming technology into marketable products. Alternatively, this category includes concrete market-oriented ideas, which depend on further progressing on technology development process. Each category represents approximatively 50 percent (Exploration), 20 percent (Commitment), 20 percent (Creation) and 10 percent (Optimisation) of the innovations. Detailed description of the methodology: The methodology applied to gather this intelligence was originally described in a report by the European Commission's Joint Research Centre published in July 2015.